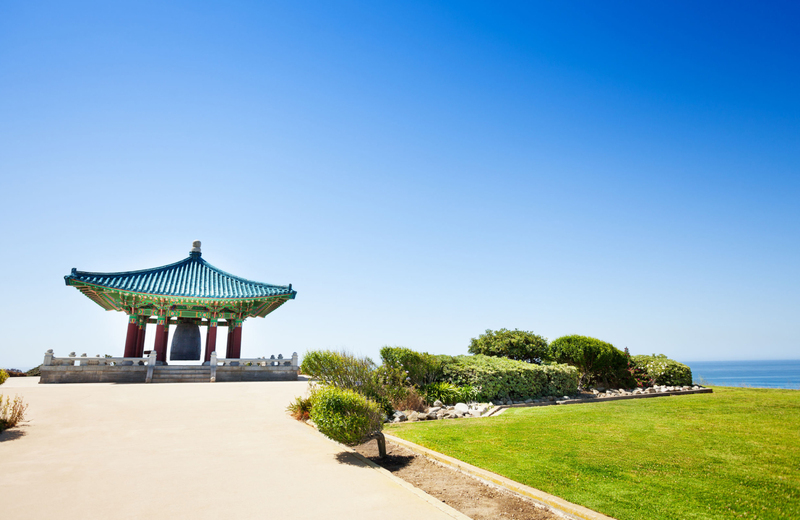 If you’ve spent any time in Southern California, rent a spot in San Pedro, or frequent the Angel’s Gate Park, then you’ve probably at least heard about the Korean Bell of Friendship. It’s hard to miss, being so massive, but how much do you know about it? Most can’t provide many words beyond, “it’s Korean,” which is a shame, as the landmark is more than just a giant decoration. There’s symbolism and history there, and, beyond that, plenty more about the surrounding area you owe it to yourself to know. Today, we’re going to be taking a closer look at that massive, bronze bell in Angel’s Gate Park, taking a look into how it came to be, what it signifies, and a few other points of interest you might not ever have even thought of. Let’s begin. What is the Korean Bell of Friendship? Let’s get the overview out of the way first. If you head to Angel’s Park, located on the southern tip of San Pedro (west of Long Beach), you’ll find within the park a separate area, where the Upper Reservation of Fort MacArthur once stood. In this section, sometimes called Korean-American Peace Park, you’ll find a colossal monument — the Korean Bell of Friendship. To give you an idea of its stature, we’ll provide some states. The bell, which is made from more than seventeen tons of copper, tin, gold, nickel, and lead, has a diameter of 7.5 feet, stands about 12 feet tall, and has an average thickness of roughly 8 inches. The exterior of the bell is decorated, two relief figures featuring the Goddess of Liberty (the resemblance to the Statue of Liberty is not unnoticed) and the Seonnyeo (a Korean spirit) adorn its surface. The Seonnyeo holds the national symbol of South Korea, the Taegeuk, which is a branch of rose of Sharon along with a branch of laurel and a dove. There are also the rather intricate geometric patterns. They can be varied, from circles squares, triangles, and lines, to suns, moons, stars, mountains and rocks. There are even floral designs (such as the lotus flower, orchids, peonies and pomegranates) and animal designs that include dragons, elephants, lions, tigers, and a host of other well-respected beasts. The United States and South Korea have been closely linked since the Cold War, when our countries joined forces to create a “bulwark against the communist expansion in Asia,” the Council on Foreign Relations notes. South Korea has experienced tremendous economic, political, and military growth since the days of the Korean War, and even to this day, most South Koreans view the United States positively, and most Americans have similar sentiments about South Korea. The alliance is strong, and those bonds of friendship run deep. What better way to signify it, then, than with such a spectacular monument? The bell is struck five times a year to mark the passing of significant days on the calendar: New Year’s Eve, Korean American Day (January 13th) the Fourth of July, Korean Liberation Day (August 15th), and Constitution Day (September 17th). Next time you take a stroll past the bell, you can do so knowing that it’s more than just a pretty landmark resting in the park. No need to worry, though, because this part is fairly easy to do. All you have to do is check out fine rental communities like The Vue and you’ll be treated to the most amazing apartment experiences that you can imagine. Perfectly situated in a gorgeous, upscale San Pedro community, you’ll be able to enjoy the most of what the area has to offer — including the prestigious Korean Bell of Friendship — in short order. Walking to where you need to be is a breeze, and, on top of all that, you’ll have an amazing time at home, with large open bedrooms, living rooms, private patios (or balconies) and much more. Come see what it’s all about, and make it your choice for sunny Southern California living.